Behind My Red Door: Breakfast for dinner! Today brought us a mixed bag of cool weather, at times sunny and other times rainy so here Behind My Red Door I decided it was the perfect evening to serve breakfast for dinner. The menu, homemade waffles topped with strawberry rhubarb cram. Strawberry Rhubarb Cram is what we call strawberries and rhubarb cut into chunks and cooked with enough sugar to taste to cut the tartness of the rhubarb. It is then thickened a little with a cornstarch slurry and cooled. We eat it on toast, on pancakes and waffles and sometimes, I make lazy man's pie. I unroll a pie crust, cut into wedges, sprinkle with sugar and bake the wedges. Then I fill a custard cup with cram and serve a wedge on the side. Lazy man's strawberry rhubarb pie. The best part is the crust stays crisp. But today, we had our cram on our waffles. YUMMO! 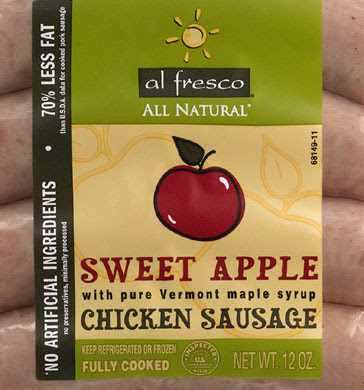 And as you can see, on the side, we enjoyed a link of all natural Alfresco Sweet Apple Chicken Sausage with Pure Vermont Maple Syrup. They are made here in MA and they are so good! You can really smell and taste the maple syrup and they are a great alternative to a regular breakfast sausage. Yesterday was a glorious late spring day while David and our son Jay were playing a round of golf yesterday, I decided to and head to Brookfield, MA to the Walker Homestead's Grand Opening. 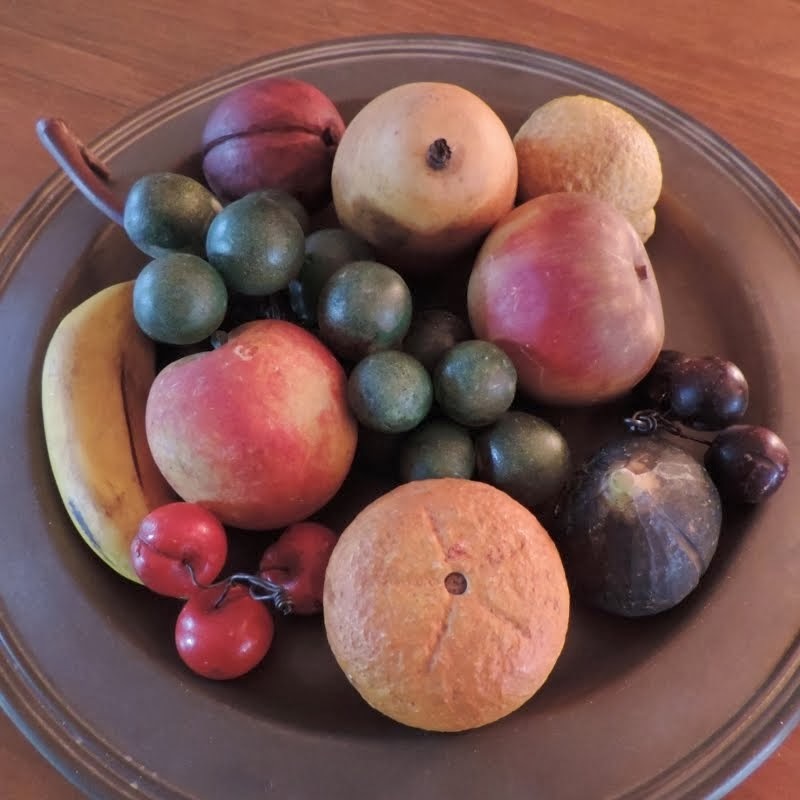 One of the partners in this new venture is Doreen from the Primitive and Rustic Forum I belong to and she posted a reminder about it and the timing was just perfect for me. 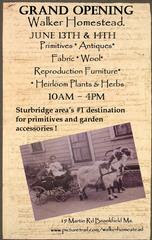 Some of you know Doreen as the proprietor of the former Primitive Cellar and Colonial Quilt Shop in Sturbridge. She has moved both shops to the Walker Homestead. 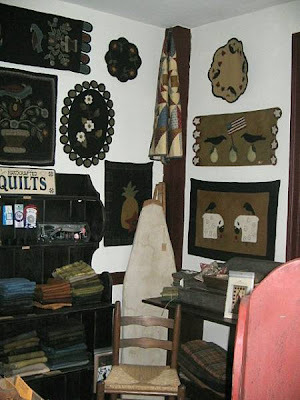 She carries a wonderful selection of reproduction fabrics, hand-dyed wool, rug hooking supplies and patterns for the primitive crafter. In addition to the very primitive decor, they offer kitchen design as well. Oh wouldn't I love to have them build me some custom kitchen cabinets instead of our outdated oak ones!! 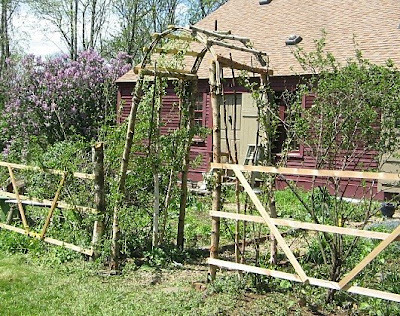 And her business partners have the most gorgeous primitive garden and offer native plants as well. You can step out the back door of the shop and enjoy a stroll in the garden. It was a lovely way to spend a little time yesterday. I look forward to going back in the fall. I can only imagine how beautiful the setting will be. The homestead is at the end of long winding road that goes up a big hill. At the end of the road, it levels out and is a one lane dirt road and then it opens up and ahead of you is the Homestead and gardens. Just the quintessential old New England homestead. I really thought I might just get a fat quarter of wool and call it a day, because I am saving my spending money for the fall, but I got really lucky and found 2 primitive portraits by folk artist Diane Ulmer Pederson who is from MA also. They are not the typical prints on paper, but are printed on stretched canvas making them look even more like an original painting. Here is the Girl with Bird in our master bedroom. Can you see the little redware jug on the left side of my glove box mirror? I got that yesterday as well. I have been asked about this mirror many times. I have had it for many years and it was made by Yield House and was dark pine when I bought. At the time, I wanted to remove the original mirror from my dresser. It was a typical dark pine with shelves on either side. Something very common in the 70's and early 80's. The glove box mirror was a great way to change the look of the dresser. Eventually I painted the mirror and more recently the dresser. It might be time to change it up again - maybe a nutmeg brown??? Oh - I got sidetracked - sorry - where was I? Brookfield is a just hop, skip and jump away from Sturbridge so I decided to make a quick stop in a shop that I don't get into very often, The Seraph. 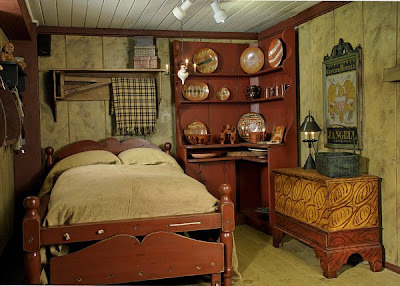 If you are a purist and have a healthy wallet, this is a great place to shop for great period reproductions. They also have a great selection of historically accurate stencils and home decor in their online catalog. 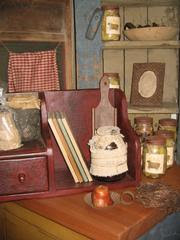 And it was in the corner on those shelves that I found that little redware jug and it had my name on it. REALLY - it said Linda - take me home! So I did! I don't usually post about giveaways on other blogs but this one is a must see. 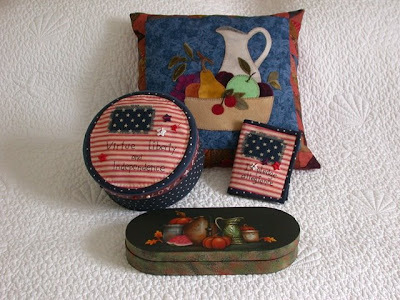 In my post HERE you saw the wonderful needle case that Kaaren of The Painted Quilt gave me. Well now she is having a very generous July 4th Give away and you can enter it by clicking HERE. 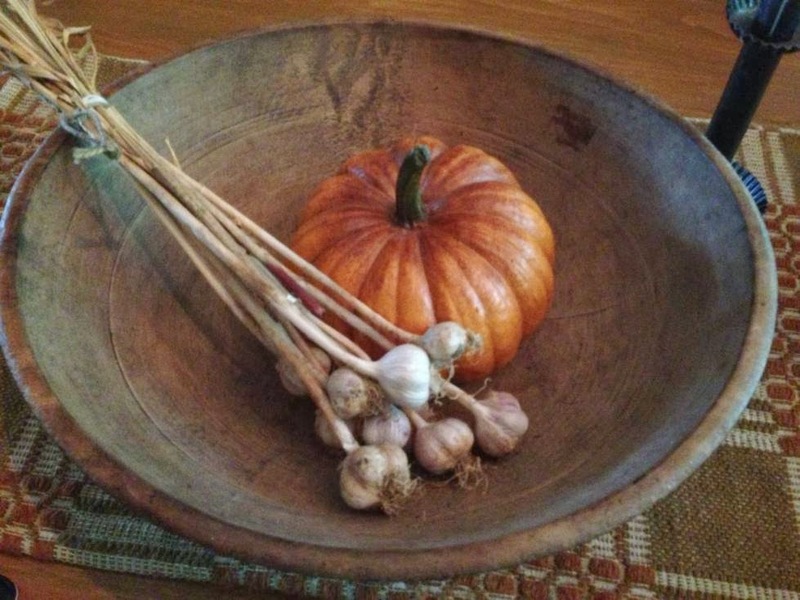 Kaaren is a very talented decorative artist and is offering 4 different items to giveaway. Each one made by Kaaren. Each one a treasure! Run on over now and enter!! Thank you to all the wonderful folks who are eagerly awaiting word on Liliana's birth. As of right now, there is nothing new to report and we are still playing the waiting game. I have cleared my calendar except for a few things that can be easily rescheduled and I am not getting into any big projects for now. I want to be ready to hop in the car at a moments notice to head to the hospital whenever Jay calls and tells me to. I so honored they want me in there when Liliana is born. The next time I am back, a few shots of our family room. I recently added some of the treasures I have been given by bloggy friends and it makes all the difference in the world.